ESTES PARK, Colo. – Steve Kenyon’s voice is recognizable to those who have heard or seen him. He’s a personality in rodeo, the radio voice that listeners turn to when they want to know what’s going on in the sport. He’s been to dozens of rodeos across this big country, so he knows the game better than most. He returns to Rooftop Rodeo for this year’s festivities, set for 7 p.m. Thursday, July 5-Tuesday, July 10, at Granny May Arena in Estes Park inside the Estes Park Fairgrounds. He will call the action for the final five nights of award-winning rodeo, and his broadcasts can be found on his website, www.ProRodeoLive.com, and on Rural Radio, Sirius Satellite channel 147. “I’ve learned as time goes on that you want to present events that are popular with the contestants and the fans,” said Kenyon, one of just eight individuals to have been honored with media awards from the largest rodeo organizations in the world, the Professional Rodeo Cowboys Association and the Women’s Pro Rodeo Association. Kenyon will actually be part of two national broadcasts coming out of the picturesque mountain town. 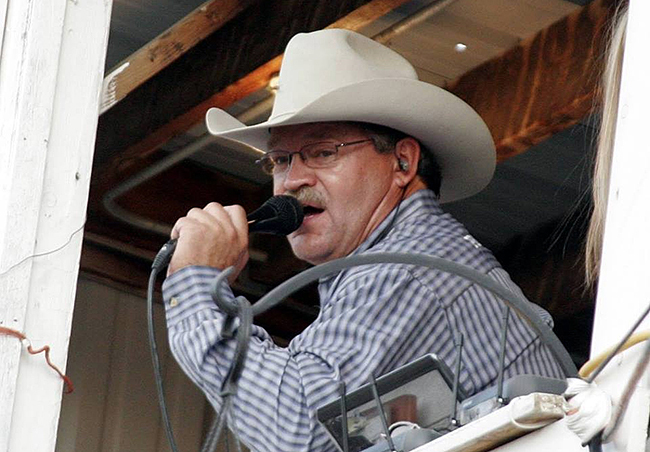 He will be joined by the Wrangler Network, www.WranglerNetwork.com, which will showcase the action during Saturday night’s July 7 performance. Kenyon is also a ProRodeo announcer who calls the action inside the arena at several rodeos around the country, but his trademark is in the radio-style play-by-play of the rodeo action. It’s something he began doing in 2006, calling the Wrangler National Finals Rodeo for a broadcasting company. When that folded after the 2007 NFR, he established the webcast on ProRodeo Live. “I saw a market there and an opportunity,” he said. “I talked to the PRCA, when Karl Stressman had just started as commissioner. He was a big supporter. I told him I’d like to continue to put the NFR on the Internet. At the time, it was just the National Finals. Five years ago, he began partnering with Rural Media Group, which owns also RFD-TV, and his broadcasts hit the national airwaves on satellite radio. “The first rodeo we did was Salinas (Calif.), and that moved into more of what I do now, including Western Sports Roundup on 147 and on RFD-TV,” said Kenyon, who indicated that several thousand people will listen in to the Rooftop Rodeo broadcasts. As he travels this country, Kenyon is offered the opportunity to see some amazing scenery and witness some incredible rodeo. He’ll have both when he arrives in Estes Park.